Feb 3, 2019 | What Am I Reading? 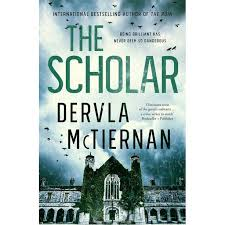 I thoroughly enjoyed Dervla McTiernan’s debut crime novel, The Ruin, and in her follow-up book The Scholar (HarperCollins 2019), we are reacquainted with the warm and enormously likeable DS Cormac Reilly. In this second book, Detective Reilly and his partner (in life, not work) Dr Emma Sweeney have moved to Galway where Cormac is sifting over cold cases and Emma is involved in biomedical research funded by the multi-billion dollar pharmaceutical company Darcy Therapeutics. As with The Ruin, The Scholar opens with a tantalising prologue set some time before the main action of the story. Carline Darcy, granddaughter of the company’s founder John Darcy, is only 12 when her father Eoghan Darcy, heir to the family fortune, is killed in a skiing accident and she is forced to live with her mother. The novel then skips to eight years later, when Carline is 20 and studying and working in scientific research herself. One evening, a young woman is found dead by Emma Sweeney outside the university, apparently the victim of a hit and run, and Emma’s first instinct is to call Cormac for help. But when a security card in the dead woman’s pocket identifies her as Carline Darcy, the inquiry becomes messy and complicated, with a great deal of high-pressure scrutiny and media interest attached. The fact that it was Cormac Reilly’s partner who found the body only intensifies the whiff of possible corruption or cover-up. As Cormac investigates, and the evidence is increasingly linked to the Darcy labs, and to Emma, Cormac finds himself in an impossible bind: can he objectively investigate a crime in which his partner might be implicated? Is he too close to see the truth? Could his loyalty blind him to the facts, and is that loyalty misplaced? Once again, Dervla McTiernan demonstrates her knowledge of and familiarity with police procedure. The book takes us step by step through the process of gathering evidence, interviewing witnesses, confirming alibis, following up DNA and other evidence, and the practicalities of putting it all together to determine a possible perpetrator and to form a coherent case against the accused person. There are a number of characters who are potentially victims or witnesses or criminals; a large number of people associated with the labs, and in the friendship and family groups of the dead. In addition, a lot of the police working the case are profiled, with their possible biases for or against Cormac Reilly. And of course, the hit and run is not the only case the team are working on. Several other crimes are being investigated simultaneously, including a disturbing incident of a man attempting a murder-suicide by killing his wife and three children. This book, as with the first, is set in Ireland, and it is interesting to follow the rules and procedures of a different jurisdiction, but also satisfying to know that Dervla McTiernan now calls Australia home (and of course, in true Aussie fashion, we have subsequently claimed her as one of our own). The other attraction is that this book continues immersing us in the personal stories of both Cormac and Emma, and their backstories (particularly Emma). If you’ve read The Ruin, you will remember certain things were hinted at but not explained, and this book goes some way to a fuller understanding of their history. It also paints both characters not always in a completely positive light and allows us to see their flaws (especially towards the end of the book), which only makes them more endearing. If you enjoy authors such as Jane Harper, Emma Viskic, Candice Fox or Sarah Bailey , then this will be a compelling read.